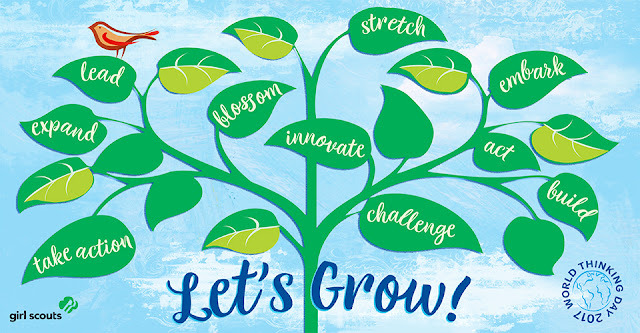 Stretching to New Girl Scout Heights: Are you ready to grow this World Thinking Day? When you’re a Girl Scout, you’re part of so much more than one troop, one community, one geography, and that’s part of what makes this journey so unique and so life-changing. Because when you’re a Girl Scout, you’re part of a very special, very expansive network of extraordinary girls and women that spans all the way across the world. And every single one is a force to be reckoned with. Whether she’s in the United States, Italy, Japan, or anywhere in between, one thing’s for sure. She’s a G.I.R.L. (Go-getter, Innovator, Risk-taker, Leader)™ and she’s out to change the world—it’s in our DNA and it’s something to celebrate! And celebrate we do—every year on February 22 Girl Scouts and Girl Guides from 146 countries (yes, 146!) observe World Thinking Day (WTD) by rallying our global sisterhood around a particular theme, and supporting girls as they travel internationally by donating to the Juliette Low World Friendship Fund. It’s a fantastic way to connect with sister Girl Guides and take action globally. World Thinking Day gives us the chance to honor the incredible depth of our Movement across borders and oceans in a big way. The 2017 World Thinking Day theme is “grow”—inspiring girls to explore, stretch, and take on new challenges, while celebrating what it means to be part of the global sisterhood that is Girl Scouts and Girl Guides. Here are three ideas to get you geared up for your most impactful World Thinking Day yet. Remember, this year, it’s all about stepping out of those comfort zones and finding new and unexpected ways to grow, grow, grow. But hey. You’re a Girl Scout, so you’ve got this! 1 Earn your 2017 World Thinking Day badge! If you’re a Daisy, Brownie, or Junior, you can earn your 2017 World Thinking Day badge by growing in “shine” and friendship, or by taking action to address something that’s important to you, like making your very own badge or planting a “worldly” garden. And if you’re a Cadette, Senior, or Ambassador, you can earn your award by growing in storytelling, adventure, service, self-awareness, and reflection, or by making your very own badge. Get the full scoop and list of activities by grade level, and let’s get to growin‘ and earnin‘! 2 Make your environment bloom! Plant a tree as part of the 2017 World Thinking Day challenge. As Girl Scouts and Girl Guides, building a better world through environmental stewardship has always been close to our hearts. This World Thinking Day gather your troop and your gardening supplies and get outside to plant a tree, or two, or three! Then snap some fun photos of the activity and post them to your social media with the hashtags #LetsGrow and #WTD2017. Let’s show the world how Girl Scouts are taking the lead to make the environment bloom! It will be fun to see how your fellow Girl Scouts around the world stepped up to the challenge. 3 Decide on three new things to try with your Girl Scout friends in 2017 and map out your plan of action! At Girl Scouts, growing is all about trying new things, challenging yourself to embark on adventures, and learning from those experiences to create meaningful change in yourself and in the world. What better way to celebrate World Thinking Day this year than to gather around with your Girl Scout friends and decide on three new things you will commit to trying together? Whether it’s getting involved in a service project you’ve never done before, visiting a park you’re not familiar with, taking a big trip, learning a new skill, or just challenging yourselves to try a sport you haven’t played yet—there’s so much to choose from. Once you pick three things, spend some time mapping out a plan of action along with a timeline to make sure you try all three things before 2017 is over. Now, that’s a year full of growth to look forward to! Have your own fun plans to celebrate World Thinking Day in 2017? Make sure to inspire your fellow Girl Scouts by sharing your plans on social media with the hashtag #WTD2017. We can’t wait to see what you’ve got in store!